Revolutionary digital technology! This winder can make any mechanical watch, in effect, a Tourbillon watch. The photo-optic system counts each cylinder rotation and automatically advances the rest position 30 degrees after each rotation. This negates accuracy errors caused by gravity while any mechanical watch is on the winder. 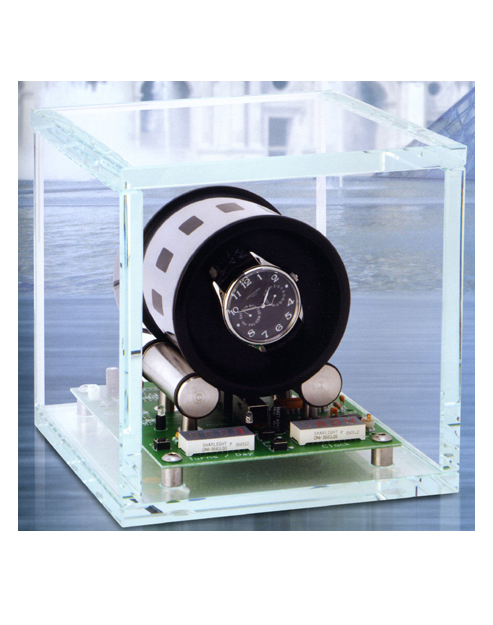 This winder is provided completely assembled in a 3/8" thick crystal glass enclosure which allows viewing of the operating mechanism and the lighted displays, and packaged to prevent damage in shipment. The unit is supplied with a universal AC/DC adapter for 110/240 VAC, 50/60 hz, and a 6-foot cord. This watch is covered by the Orbita 2 Year Warranty from the date of sale.